Keto Brown Butter Cake a delicious yet easy low carb cake that features the flavor of brown butter. This recipe is low in carbs, gluten-free, grain-free, sugar-free and keto-friendly. I don’t know about you but anything recipe that uses browned butter in a cake has my full attention. 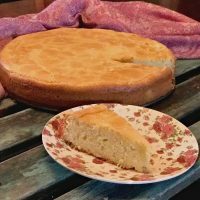 I used to make a sponge cake that called for brown butter years ago when I was not doing keto. Unfortunately, besides the rich butter taste, it was loaded with sugar and high in empty carbs. So when I began to crave that recipe I rolled up my sleeves went into my kitchen, said a prayer and began to try to recreate the same flavor profile except that this cake would certainly now be a low carb butter cake. I am happy to report that this keto butter cake turned out exactly how I had hoped. It’s the perfect cake to use when you need a good basic vanilla cake. If you’re a fan of cakes make sure you also check out our large collection of Keto Cakes recipes. My low carb brown butter cake is a cross between a sponge cake and a pound cake. It’s probably one of my easiest recipes and yet it’s packed with flavor because of all that delicious brown butter. The extra step of browning the butter is worth every effort because it truly intensifies the flavor of butter. I think it makes the perfect vanilla cake that can be easily used when you need a layered cake. Lately, it seems like I’ve been craving butter more and more. No doubt it’s the reason I came up with this recipe for low carb brown butter cake. Don’t get me wrong, I have always loved butter. In fact, even during the fat-fearing era of the ’80s and ’90s this girl always chose butter over margarine. I just couldn’t get past the fake taste of margarine. Which is why I always baked with real butter and refused the margarine unless I was really pressured into using it by my mom. UGH, If only I knew then, what I know now. Because the truth is there was absolutely no need to fear butter. Since going low carb keto, I embrace butter even more and have NO guilt in saying that I LOVE baking with only the real thing. Having been consistently on a low carb diet since January of 2014, I think it’s safe to say that being in ketosis has become a lifestyle. As a recipe creator being able to embrace fat without fear is a very good and tasty thing. Especially since I know that all the flavor is in the fat. A recipe like this brown butter cake allows me to enjoy the richness of butter completely guilt-free. People are becoming aware of this way of eating because so many people are seeing major results on it. What about the amazing foods you can eat on this lifestyle? PLUS I have created tons of keto recipes with the intent to make things easy for you. I mean if the idea of having a low carb brown butter cake doesn’t appeal to you, I don’t know what will. Randy and I know the benefits first-hand of a keto diet, as it was the very tool God pointed us to when we were desperately seeking a solution to transform our health. You can read more about our personal journey on Our About Page. When we changed our diet, we began to understand ketosis and the role it played in our health. This recipe uses a generous amount of butter so don’t be alarmed by this. It’s also the reason you want to use the highest level of butter you cab afford. I always recommend grass-fed butter when ever possible. Lightly browning the butter will help the cake have a more pronounced butter flavor. However, you can opt to just melt the butter and not brown it for another flavor profile. My recipe calls for finely milled almond flour and a 1/4 cup of coconut flour. Using a combination of both flours ensures that the cake has the proper structure despite the large amount of butter in the recipe. You’ll need an electric mixer when combining the eggs and sugar substitute but when adding the dry the flours to the batter of this cake be sure to use a spatula to fold the ingredients. You do not want to over mix the batter. Once the cake is done allow to cool completely before serving and store any leftovers in the refrigerator. 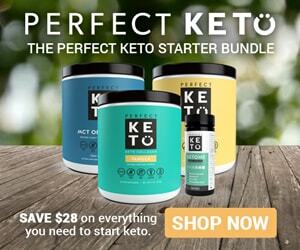 Use this link and get a 15% off discount when you place your order for any of Perfect Keto products Just add the code: FITTOSERVE at checkout. Please feel free to reach out to us to assist you in any way. our desire to see you succeed. It's a recipe for keto brown butter cake. This cake uses a generous amount of brown butter for one rich buttery low carb cake. Pre-heat oven to 350 degrees. Lightly grease a 10-inch spring-form pan with butter. Melt and lightly brown the butter in a saucepan then allow to cool completely. In a mixing bowl combine the almond flour, coconut flour, salt, baking powder and set aside. Beat all the eggs and sugar substitute in a stand-up mixer on high until mixture is thick and a shade of pale yellow, about 6 minutes. Add the dry ingredients in ¼ cup increments into the egg and sugar-substitute batter folding gently with a rubber spatula. *Do not over stir, mix only to combine. Once the batter has been mixed add the now cooled melted brown butter by gently folding into the batter until fully incorporated. Pour the batter into the lightly greased pan. Bake the cake for 35-40 minutes or until a toothpick inserted in the center comes out clean. Allow this cake to cool completely before serving. Store leftovers in the refrigerator. 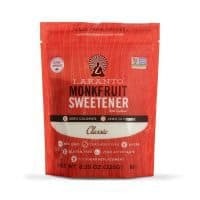 Can regular white granulated sugar be used for this recipe? Hi Ruth, You can certainly use regular granulated sugar but it will no longer be a low carb keto-friendly cake. I've not done so, so I can't tell you if it will work well.